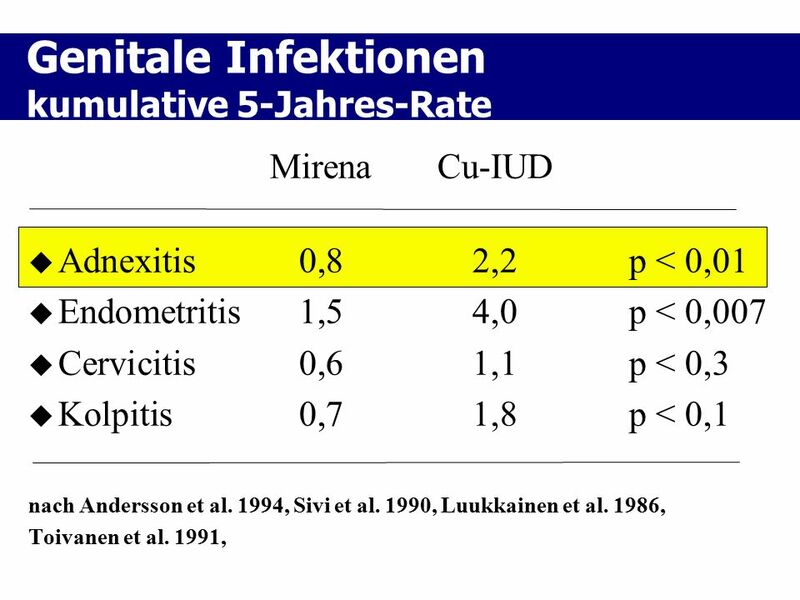 Mirena	Cu-IUD Adnexitis	0,8	2,2	p < 0,01 Endometritis	1,5	4,0	p < 0,007 Cervicitis	0,6	1,1	p < 0,3 Kolpitis	0,7	1,8	p < 0,1 nach Andersson et al. 1994, Sivi et al. 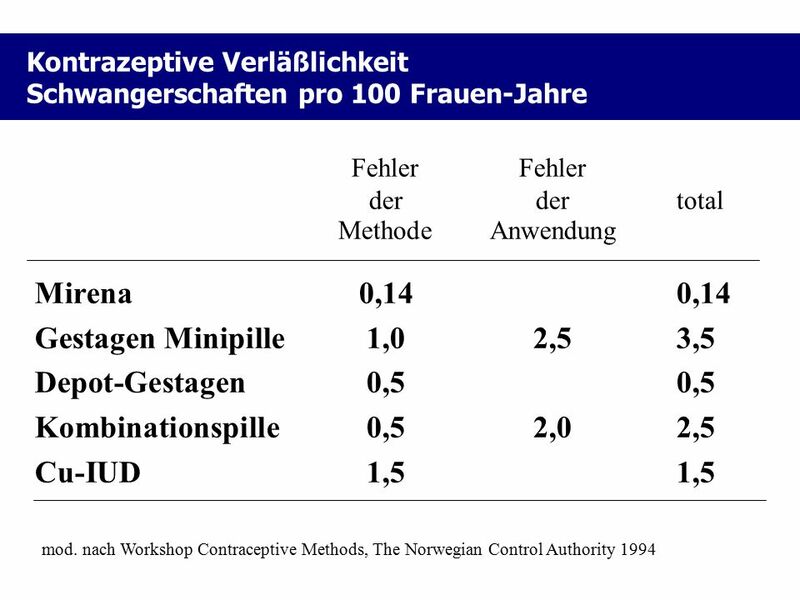 1990, Luukkainen et al. 1986, Toivanen et al. 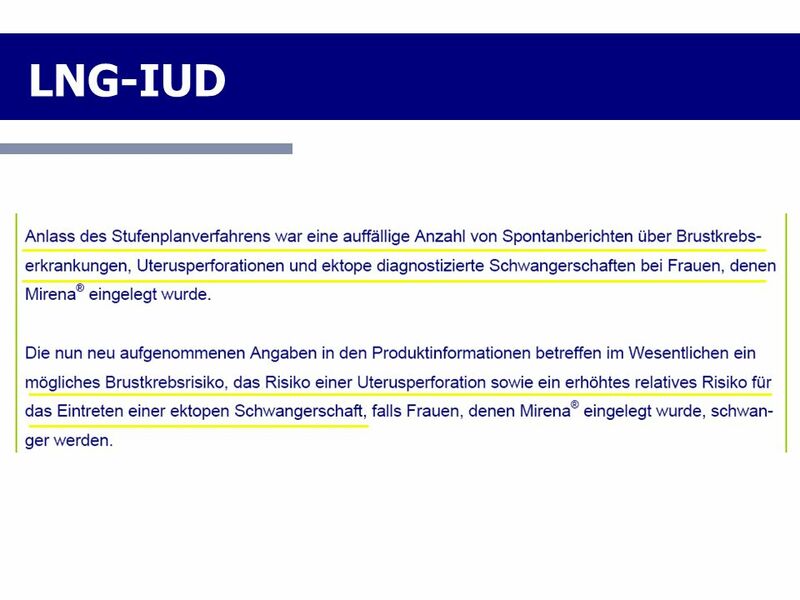 1991, Mit zunehmender Liegedauer sinkt das Risiko für PID. 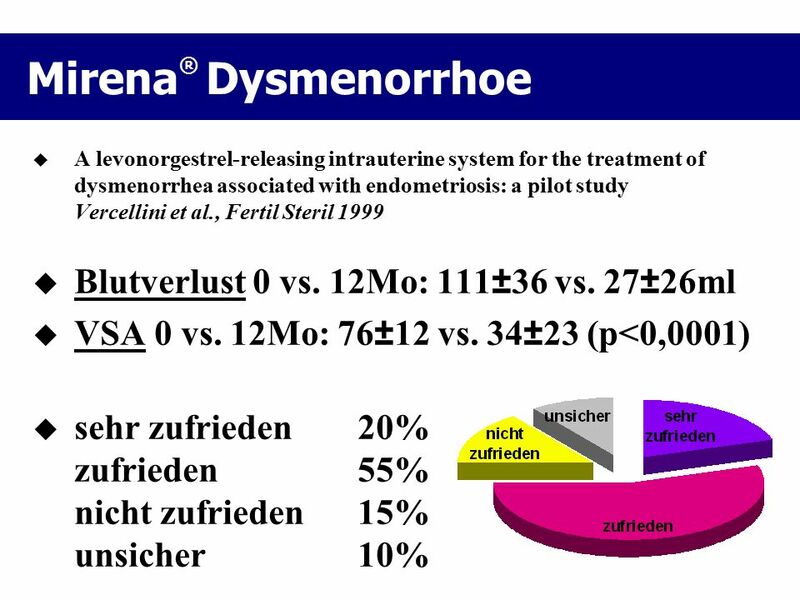 A levonorgestrel-releasing intrauterine system for the treatment of dysmenorrhea associated with endometriosis: a pilot study Vercellini et al., Fertil Steril 1999 Blutverlust 0 vs. 12Mo: 111±36 vs. 27±26ml VSA 0 vs. 12Mo: 76±12 vs. 34±23 (p<0,0001) sehr zufrieden	20% zufrieden	55% nicht zufrieden	15% unsicher	10% A levonorgestrel-releasing intrauterine system for the treatment of dysmenorrhea associated with endometriosis: a pilot study.AU: Vercellini-P; Aimi-G; Panazza-S; De-Giorgi-O; Pesole-A; Crosignani-PGSO: Fertil-Steril Sep; 72(3): 505-8JN: Fertility-and-sterility*LHM: ZBMED Zeitschriftenbestand: ZBMed-100laufender Bestand, siehe KatalogISSN: LA: ENGLISHAB: OBJECTIVE: To evaluate the efficacy and safety of an intrauterine system releasing 20 microg of levonorgestrel per 24 hours in the long-term treatment of recurrent dysmenorrhea in women already operated on conservatively for endometriosis. DESIGN: A prospective noncomparative pilot study. SETTING: A tertiary care and referral academic center for patients with endometriosis. 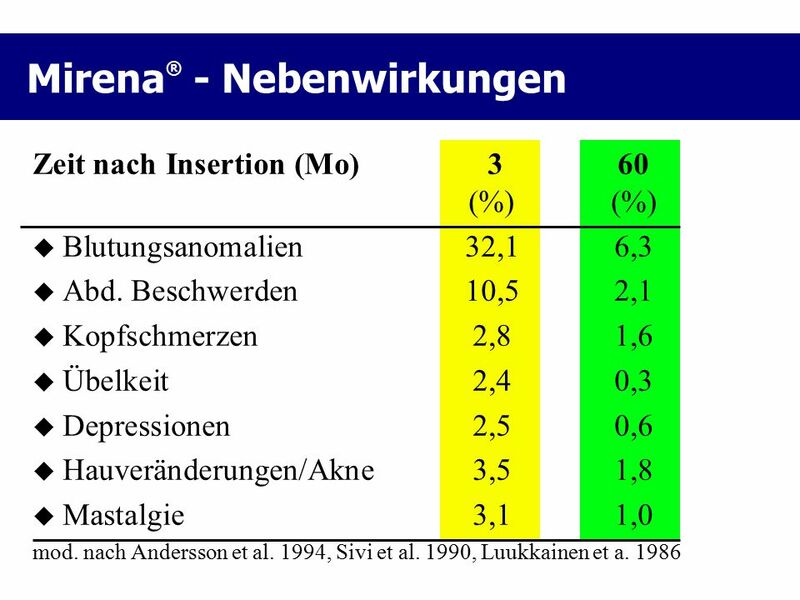 PATIENT(S): Twenty parous women with recurrent moderate or severe dysmenorrhea after conservative surgery for endometriosis who did not want further children. 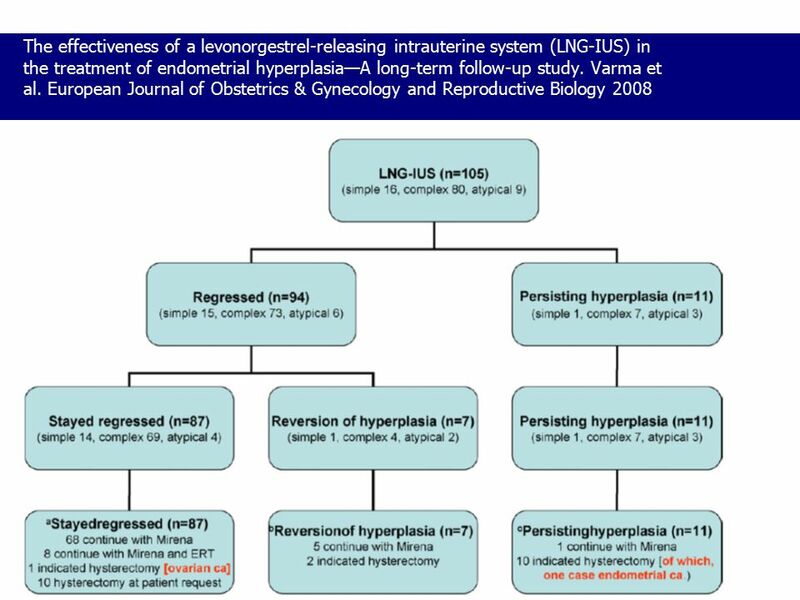 INTERVENTION(S): A levonorgestrel-releasing intrauterine system was inserted in each woman within 7 days of the start of a menstrual cycle. 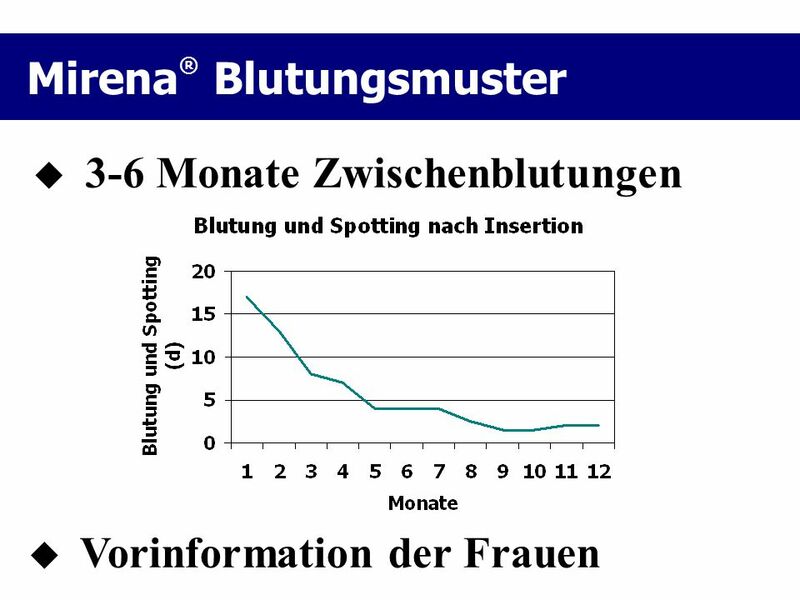 MAIN OUTCOME MEASURE(S): Variations in severity of dysmenorrhea during treatment according to a 100-mm visual analogue scale and a 0-3-point verbal rating scale, modification of a pictorial blood-loss assessment chart devised to evaluate the amount of menstrual flow, and degree of satisfaction after 12 months of therapy. RESULT(S): One woman was lost to follow-up after achieving amenorrhea and expressing satisfaction, and 1 requested system removal because of weight gain and abdominal bloating. 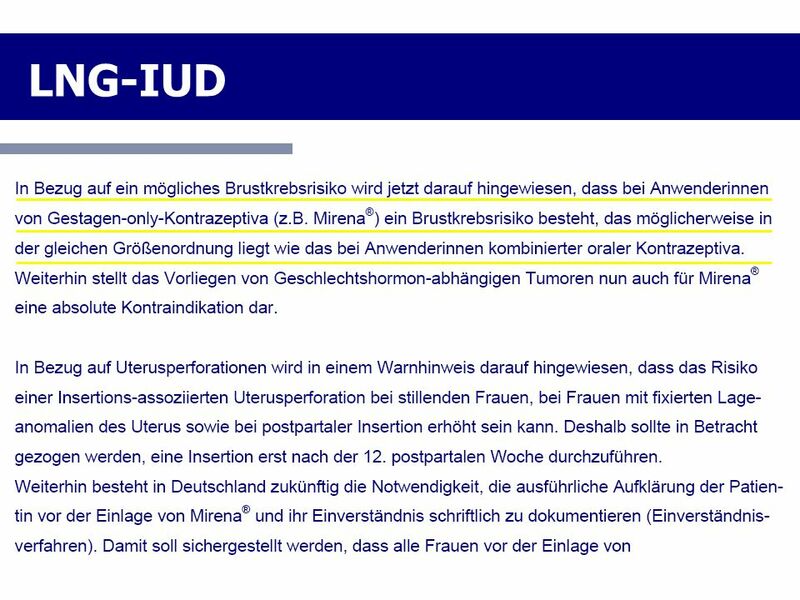 In another subject, the levonorgestrel intrauterine system was expelled 3 months after insertion. 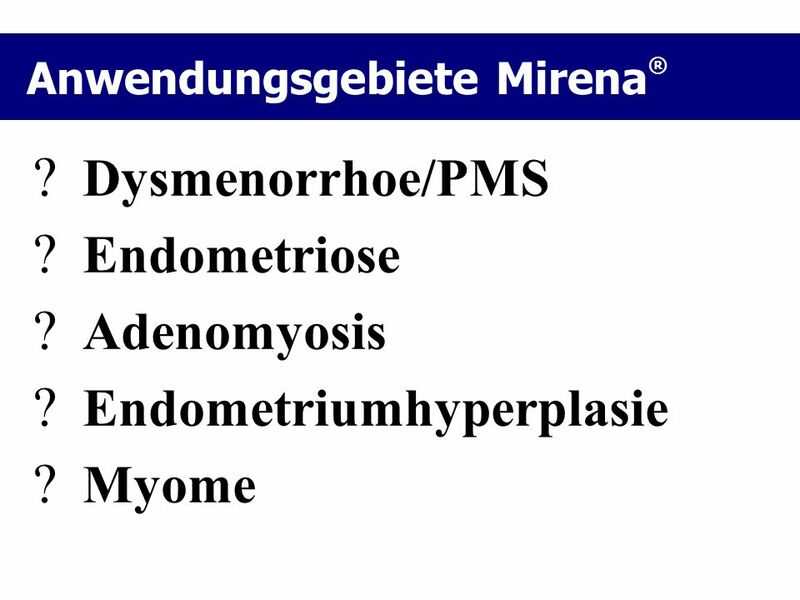 The menstrual patterns in the remaining 17 women were characterized by amenorrhea in 4 cases, hypomenorrhea or spotting in 8, and normal flow in 5. 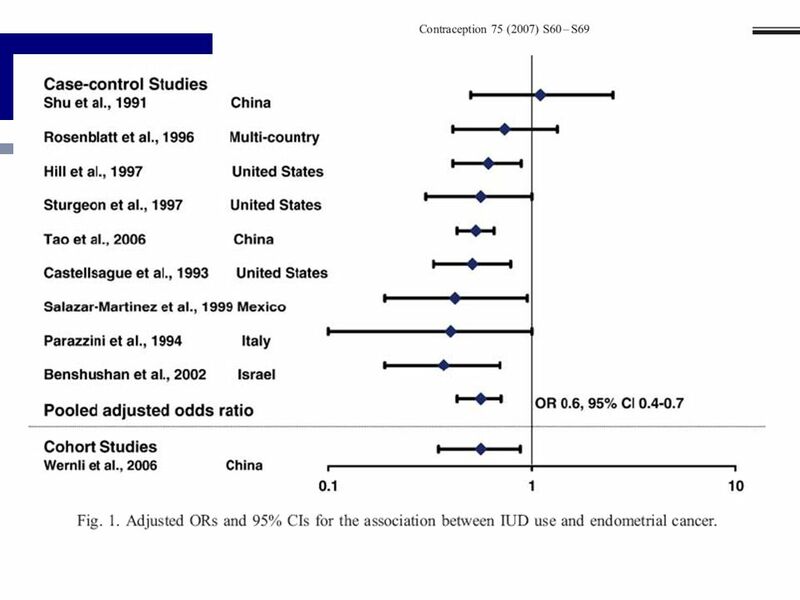 Baseline and 12-month follow-up mean +/- SD blood loss scores were 111+/-36 and 27+/-26, respectively. At the same time, mean +/- SD visual analogue and verbal rating scale scores dropped, respectively, from 76+/-12 to 34+/-23 points and from 2.5+/-0.5 to 1.2+/-0.5 points. Four women were very satisfied with treatment, 11 were satisfied, 2 were uncertain, and 3 were dissatisfied at 12-month follow-up. 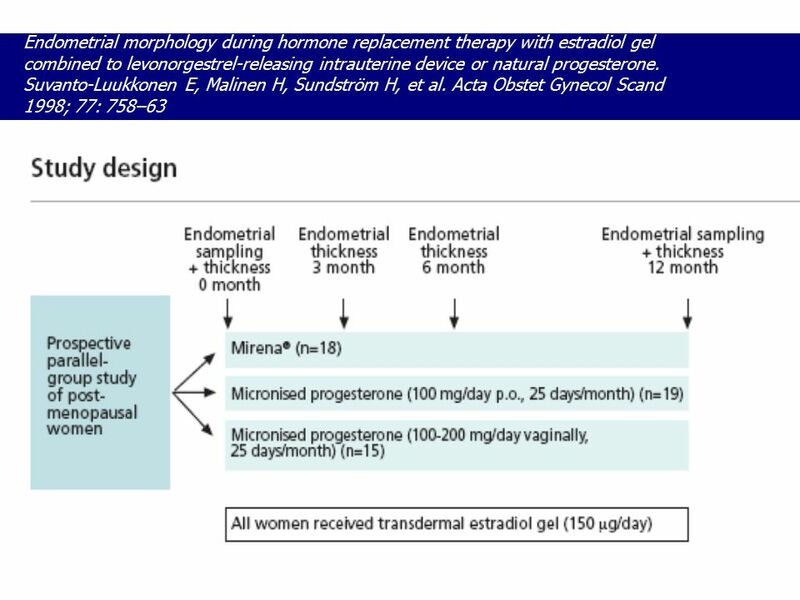 CONCLUSION(S): Because of the amenorrhea or hypomenorrhea induced in most women, a levonorgestrel intrauterine system greatly reduced menstrual pain associated with endometriosis and achieved a high degree of patient satisfaction. 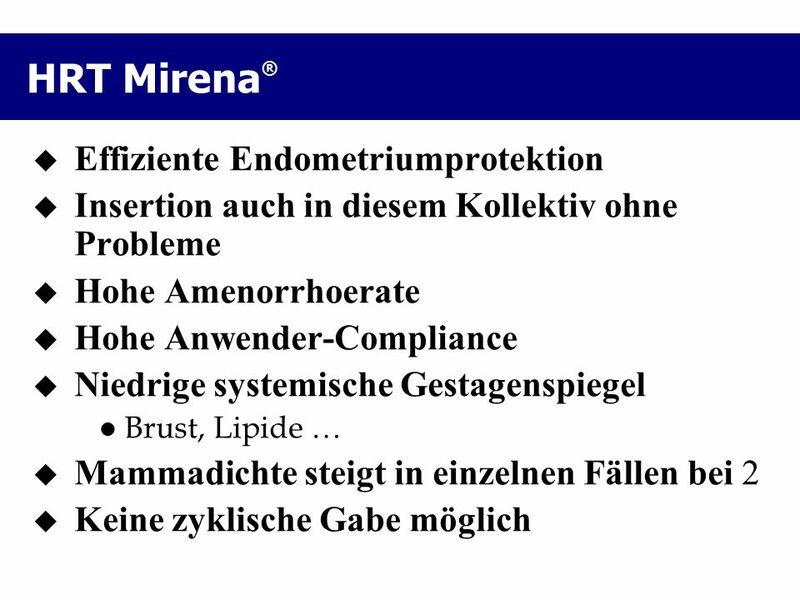 Mirena® und ERT The levonorgestrel intrauterine system in menopausal hormone replacement therapy: five-year experience. Suvanto-Luukkonen E et al. 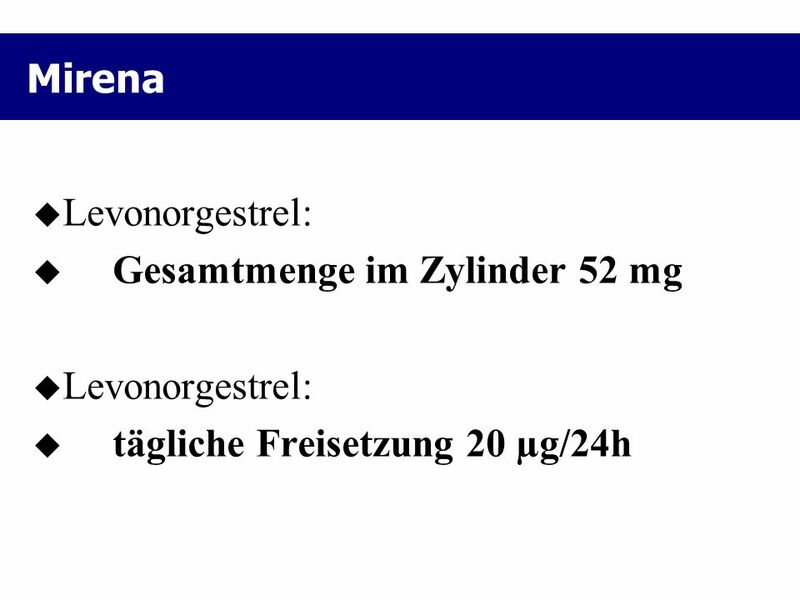 Fertil Steril. 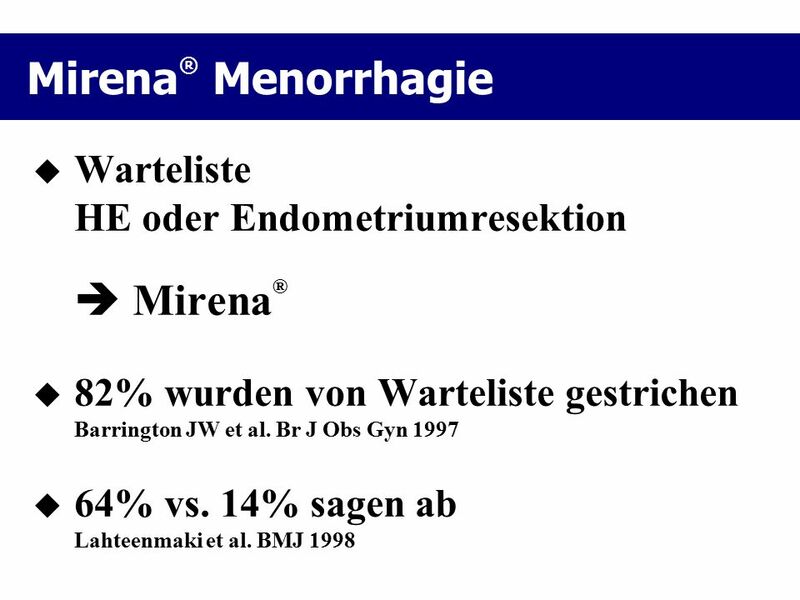 1999 Epithelatrophie, Dezidualisierung des Endometriums besser als Gestagen systemisch? 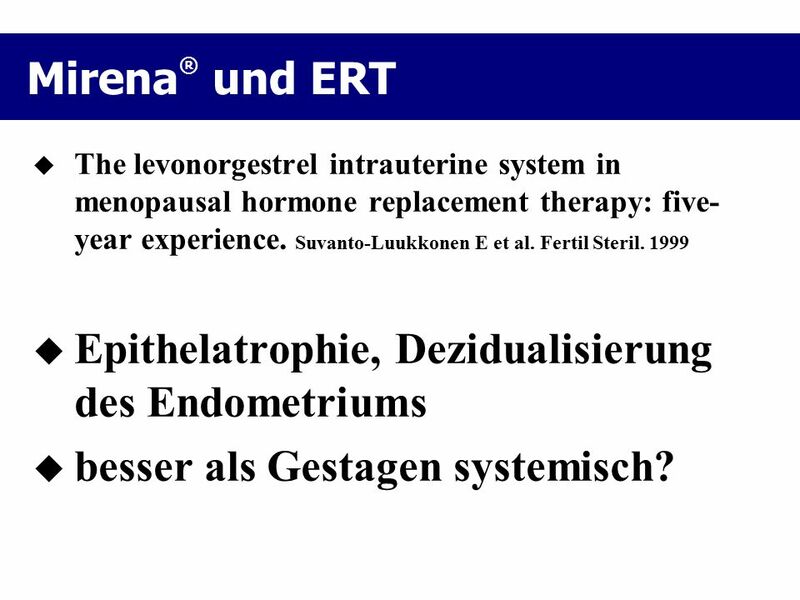 The levonorgestrel intrauterine system in menopausal hormone replacement therapy: five-year experience.AU: Suvanto-Luukkonen-E; Kauppila-ASO: Fertil-Steril Jul; 72(1): 161-3JN: Fertility-and-sterility*LHM: ZBMED Zeitschriftenbestand: ZBMed-100laufender Bestand, siehe KatalogISSN: LA: ENGLISHAB: OBJECTIVE: To study the long-term effects (5 years) of intrauterine levonorgestrel administration as the progestin part of continuous combined postmenopausal hormone replacement therapy. DESIGN: Prospective clinical study. SETTING: Department of obstetrics and gynecology at a central hospital. 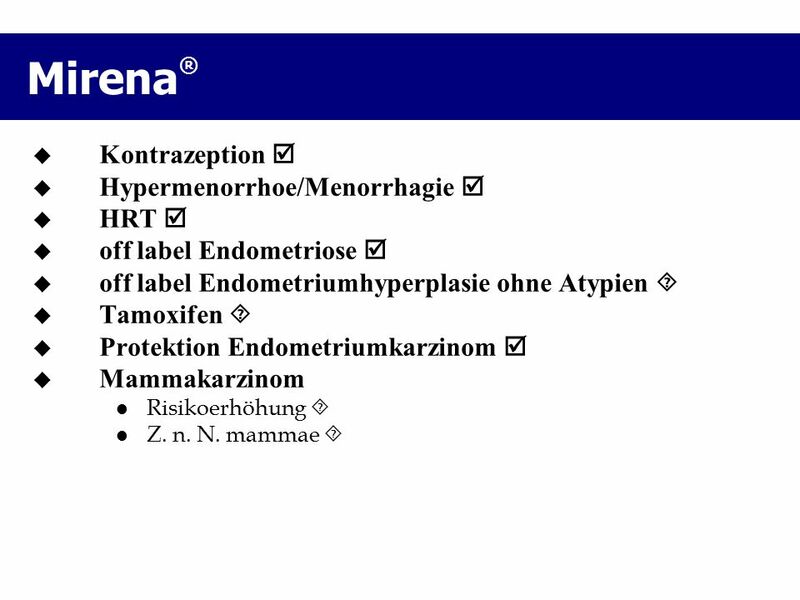 PATIENT(S): Twenty postmenopausal women with an intact uterus who had no contraindications to hormone replacement therapy and who wanted to take amenorrhea-inducing hormone replacement therapy to relieve their climacteric symptoms. 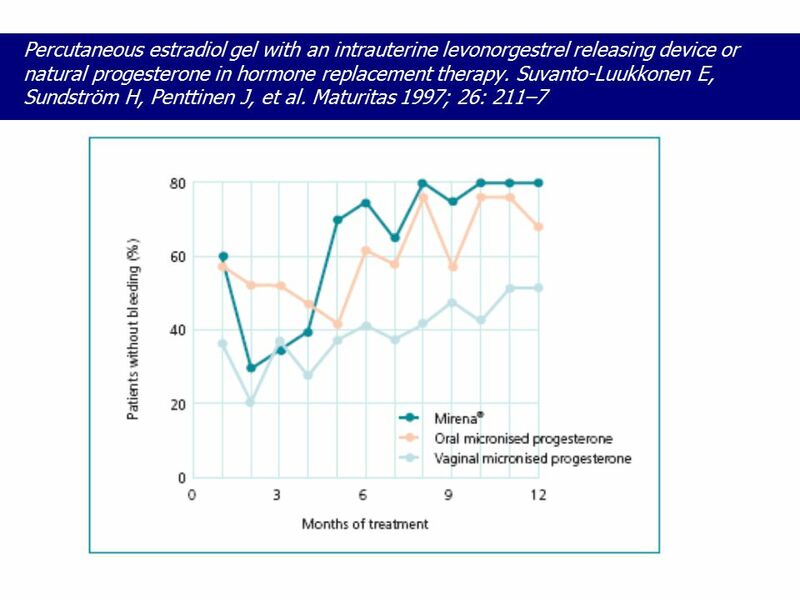 INTERVENTION(S): A percutaneous E2 gel containing 1.5 mg of E2 was administered daily and a levonorgestrel-releasing intrauterine device was used. Endometrial thickness was measured by vaginal ultrasonography. 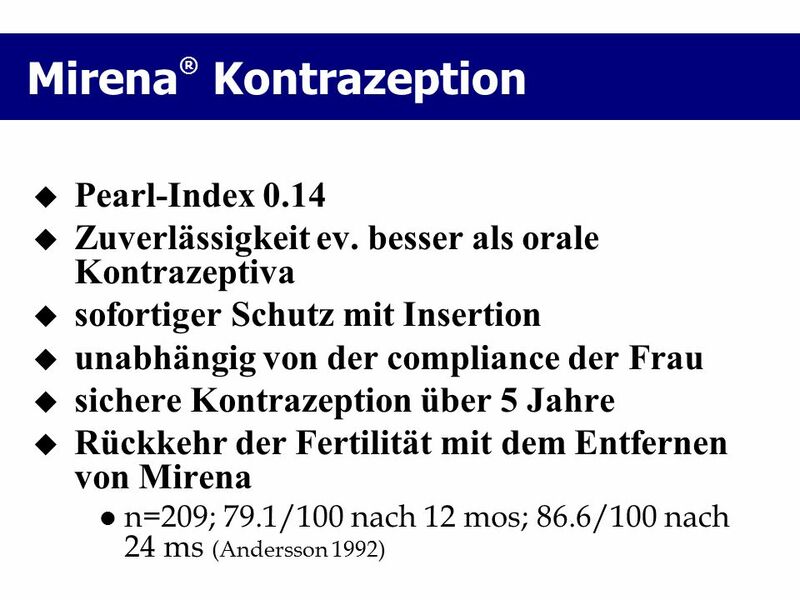 Endometrial sampling was performed yearly. MAIN OUTCOME MEASURE(S): Clinical compliance, profiles of bleeding, and endometrial thickness and morphology were monitored during 5 years of follow-up. RESULT(S): Eighteen women completed 1 year of follow-up. Fifteen of these women were willing to continue the study, and 12 of them completed 5 years of follow-up. Spotting was frequent during the first 6 months of the study and declined thereafter. 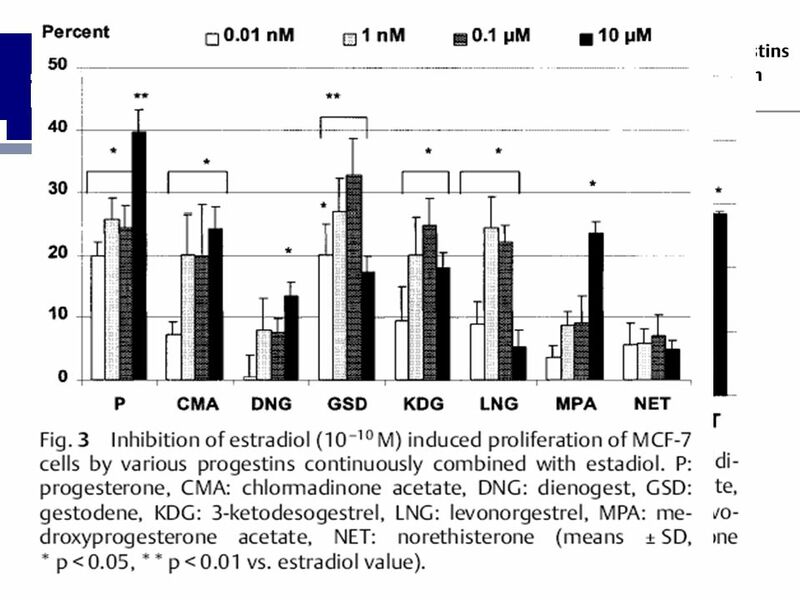 At 1 year, 80% of the women were totally amenorrheic. 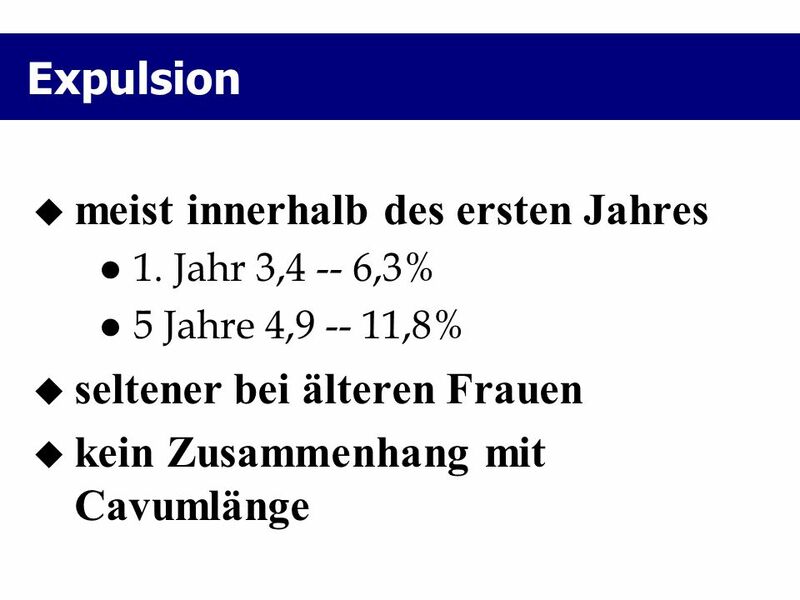 Of the 15 women who continued the study, 12 were totally amenorrheic and 3 had problems with bleeding. 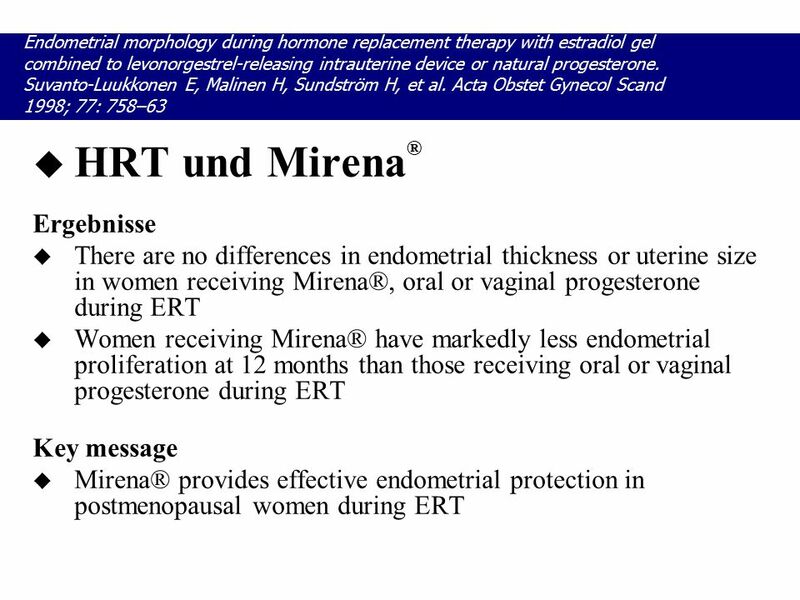 The mean endometrial thickness was < or = 3 mm during the study. Endometrial morphology showed epithelial atrophy accompanied by decidualization of the stroma in all 12 of the women who were followed up for 5 years. 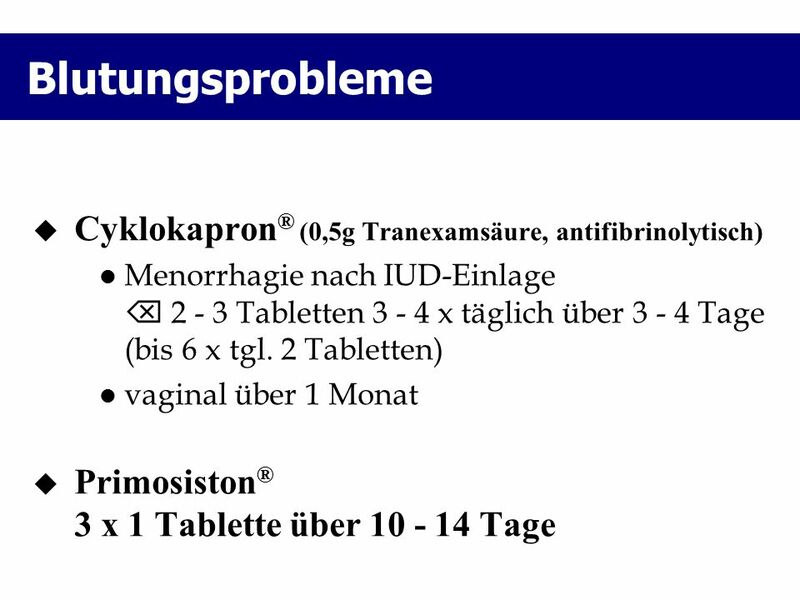 CONCLUSION(S): Intrauterine administration of progestin through a levonorgestrel-releasing intrauterine device is a good alternative as the progestin part of continuous combined hormone replacement therapy because it effectively opposes the estrogenic effects on the endometrium and induces amenorrhea in most cases. 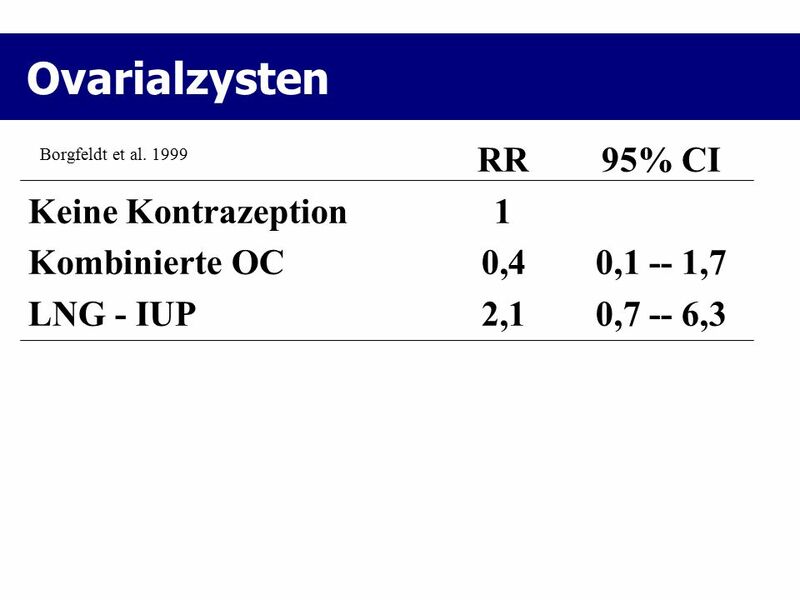 Simple Komplexe -> 1-3% EmCa Atypische -> 8-30% EmCa n=105; EM-Hyperplasie (Varma et al. 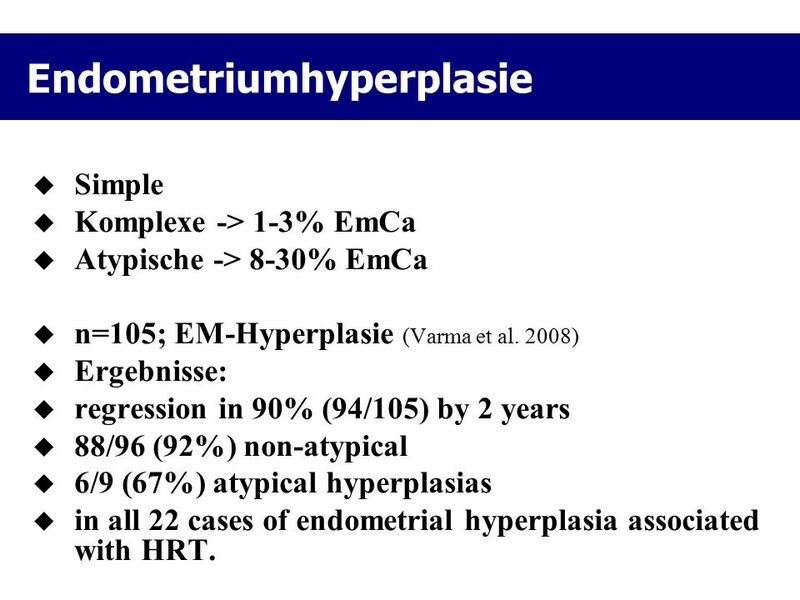 2008) Ergebnisse: regression in 90% (94/105) by 2 years 88/96 (92%) non-atypical 6/9 (67%) atypical hyperplasias in all 22 cases of endometrial hyperplasia associated with HRT. 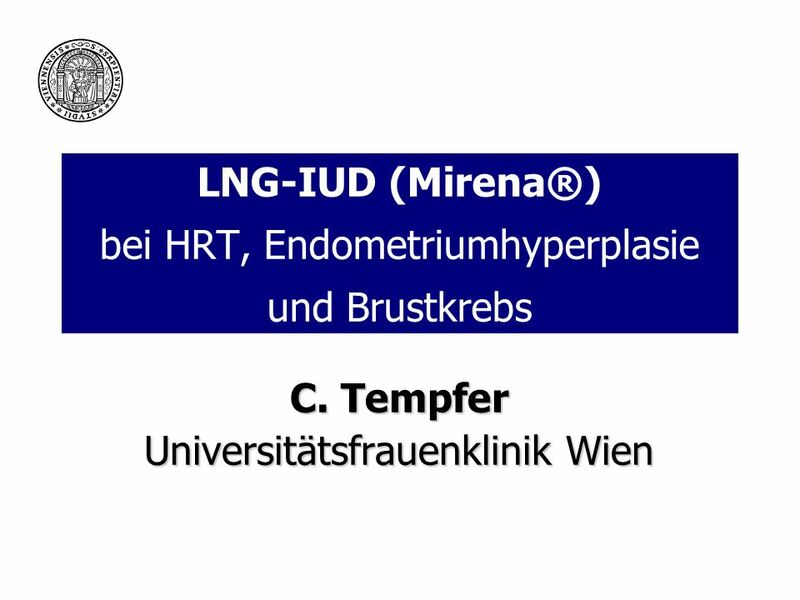 27 Levonorgestrel-releasing intrauterine device (Mirena®) and breast cancer: what do we learn from literature for clinical practice? 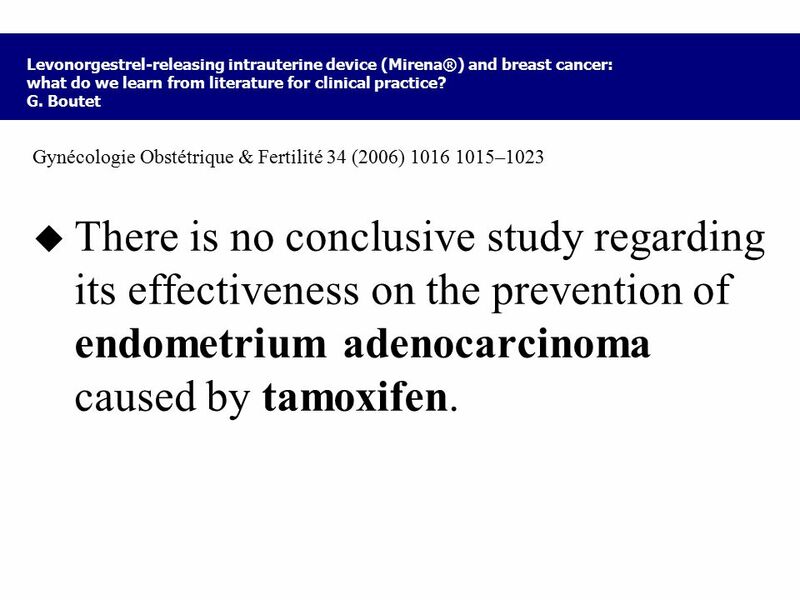 G. Boutet Gynécologie Obstétrique & Fertilité 34 (2006) –1023 There is no conclusive study regarding its effectiveness on the prevention of endometrium adenocarcinoma caused by tamoxifen. 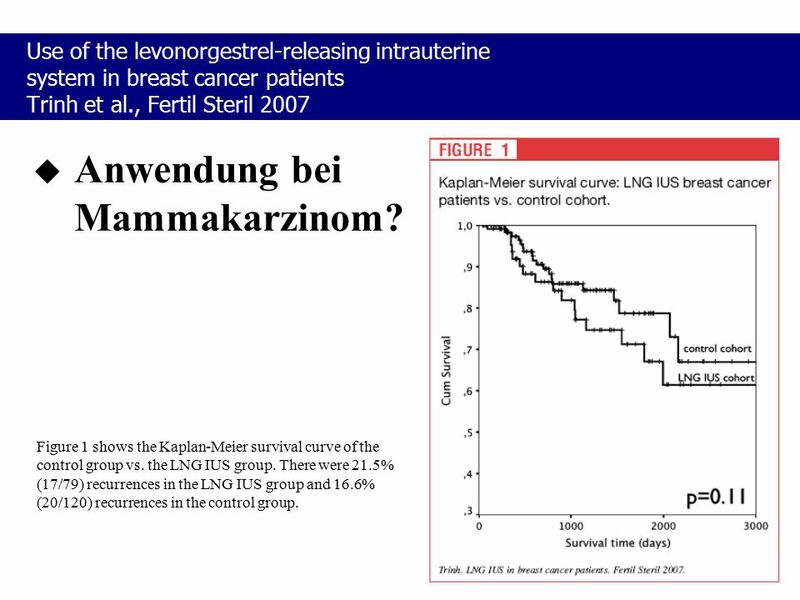 Use of the levonorgestrel-releasing intrauterine system in breast cancer patients Trinh et al., Fertil Steril 2007 Anwendung bei Mammakarzinom? 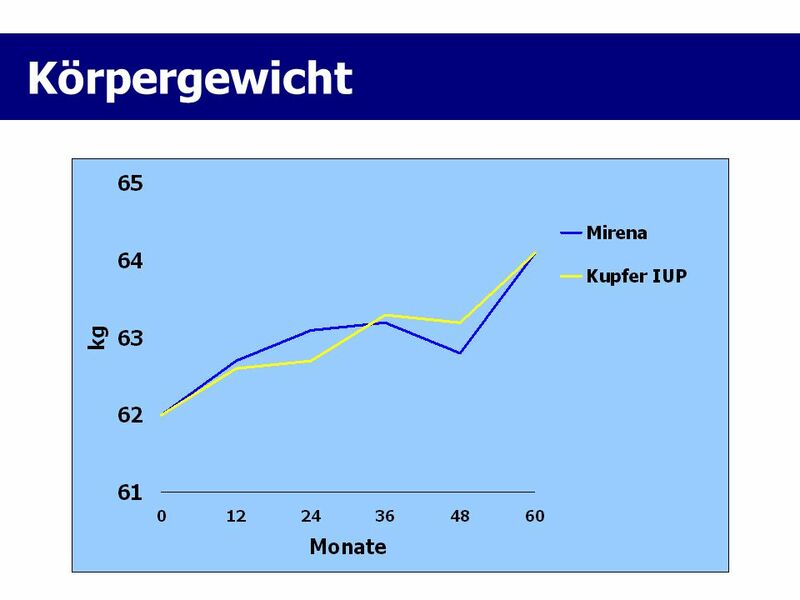 Figure 1 shows the Kaplan-Meier survival curve of the control group vs. the LNG IUS group. There were 21.5% (17/79) recurrences in the LNG IUS group and 16.6% (20/120) recurrences in the control group. 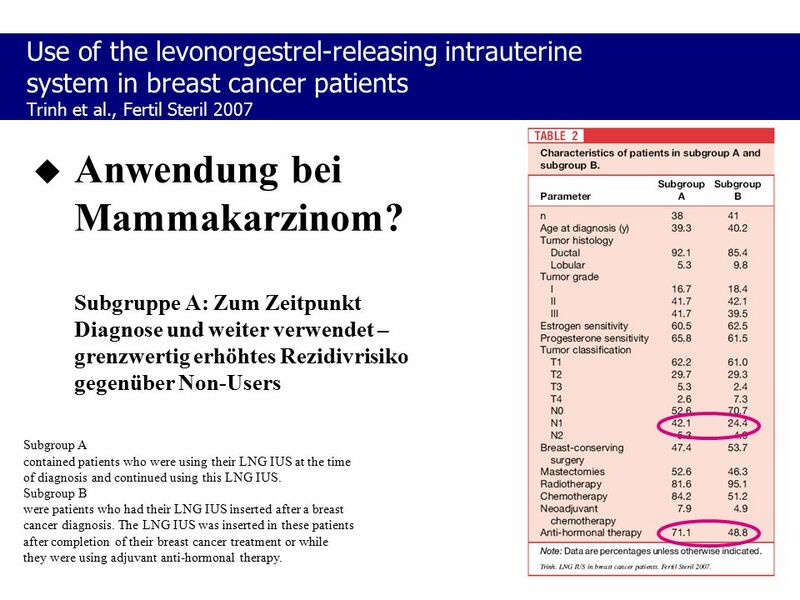 37 Use of the levonorgestrel-releasing intrauterine system in breast cancer patients Trinh et al., Fertil Steril 2007 Anwendung bei Mammakarzinom? 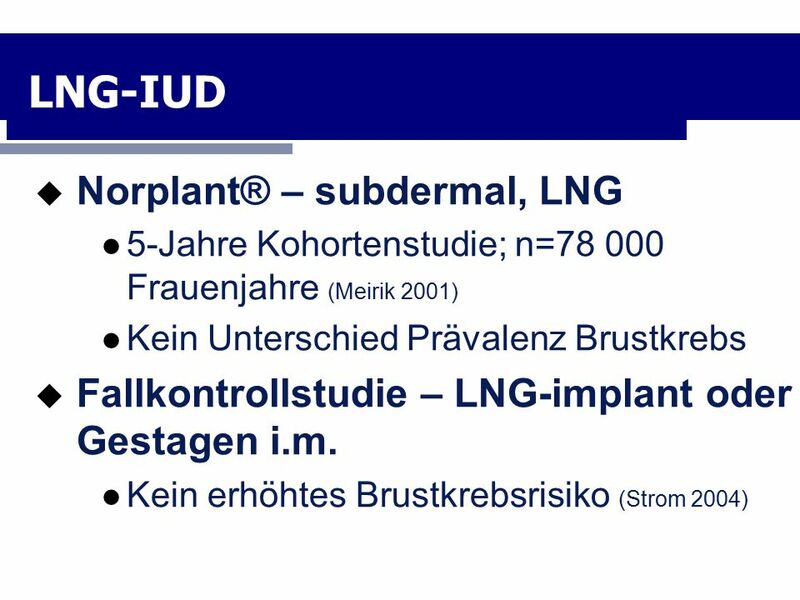 Subgruppe A: Zum Zeitpunkt Diagnose und weiter verwendet – grenzwertig erhöhtes Rezidivrisiko gegenüber Non-Users Subgroup A contained patients who were using their LNG IUS at the time of diagnosis and continued using this LNG IUS. 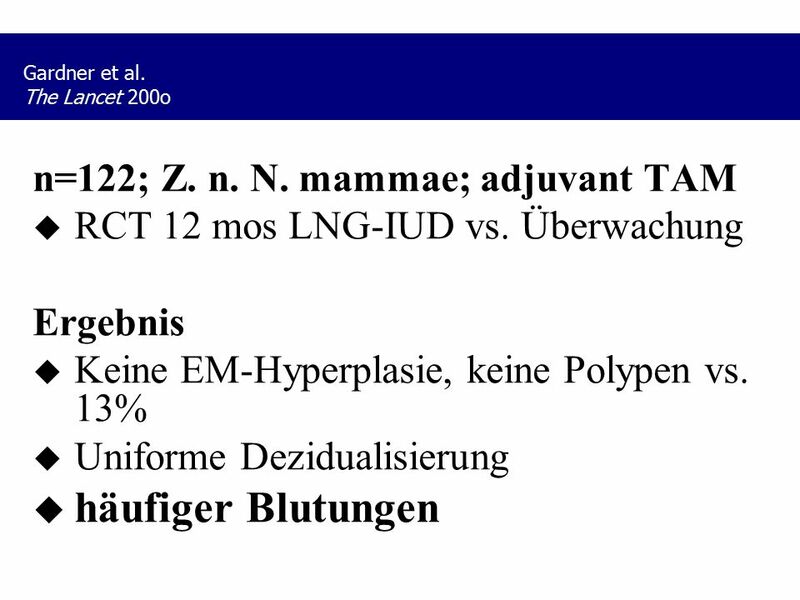 Subgroup B were patients who had their LNG IUS inserted after a breast cancer diagnosis. 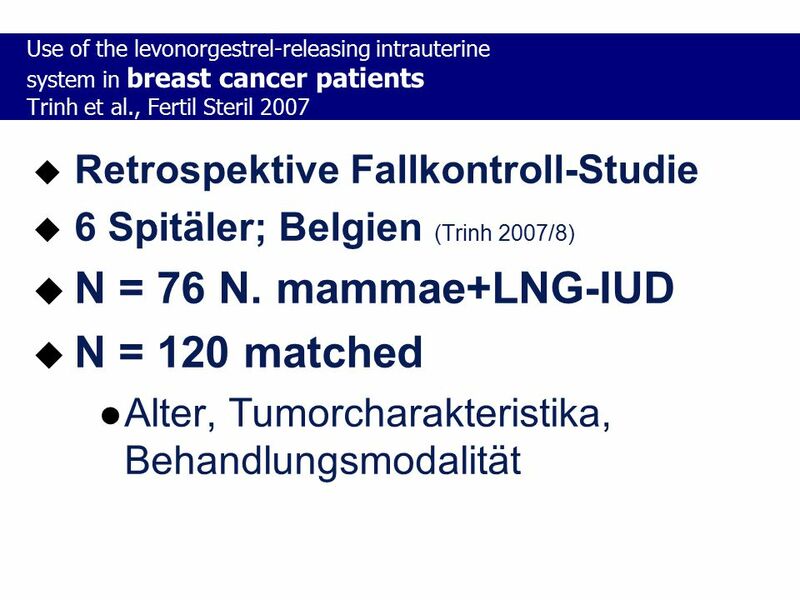 The LNG IUS was inserted in these patients after completion of their breast cancer treatment or while they were using adjuvant anti-hormonal therapy. 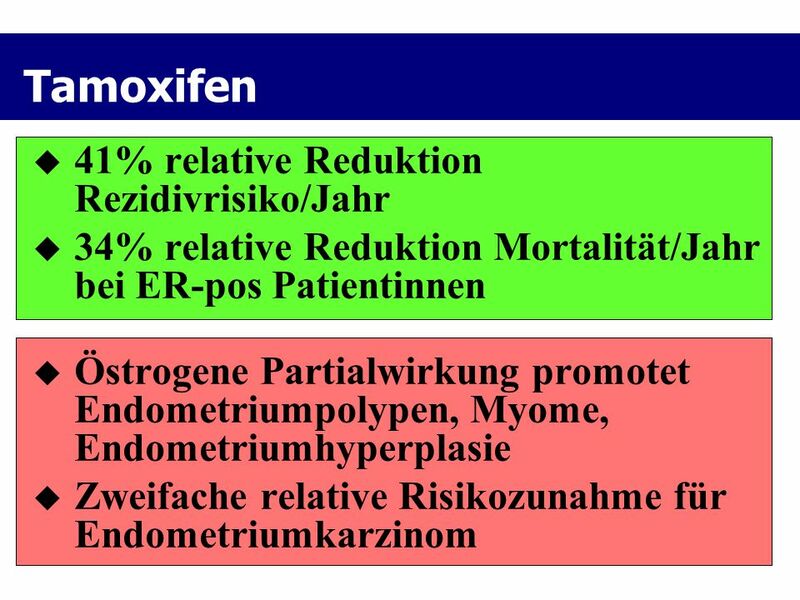 38 Use of the levonorgestrel-releasing intrauterine system in breast cancer patients Trinh et al., Fertil Steril 2007 Anwendung bei Mammakarzinom? 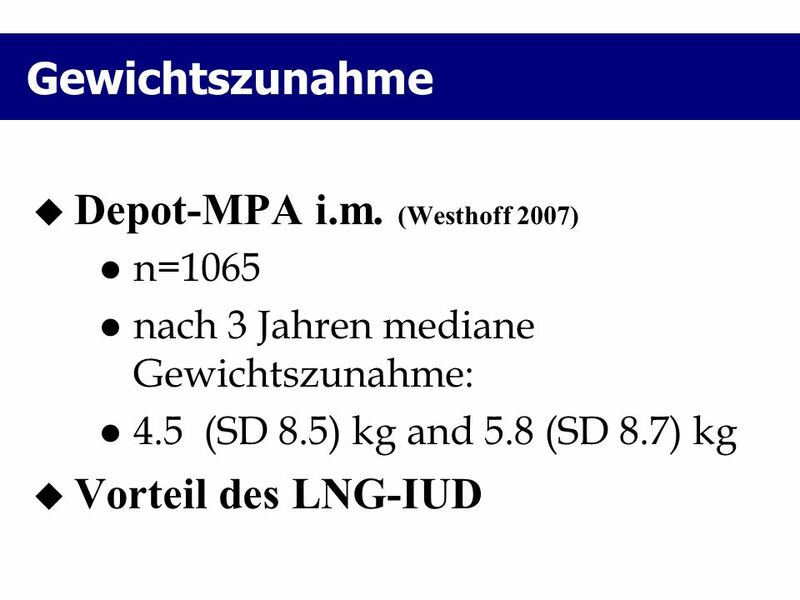 Subgruppe A: Zum Zeitpunkt Diagnose und weiter verwendet – grenzwertig erhöhtes Rezidivrisiko gegenüber Non-Users Subgroup A contained patients who were using their LNG IUS at the time of diagnosis and continued using this LNG IUS. 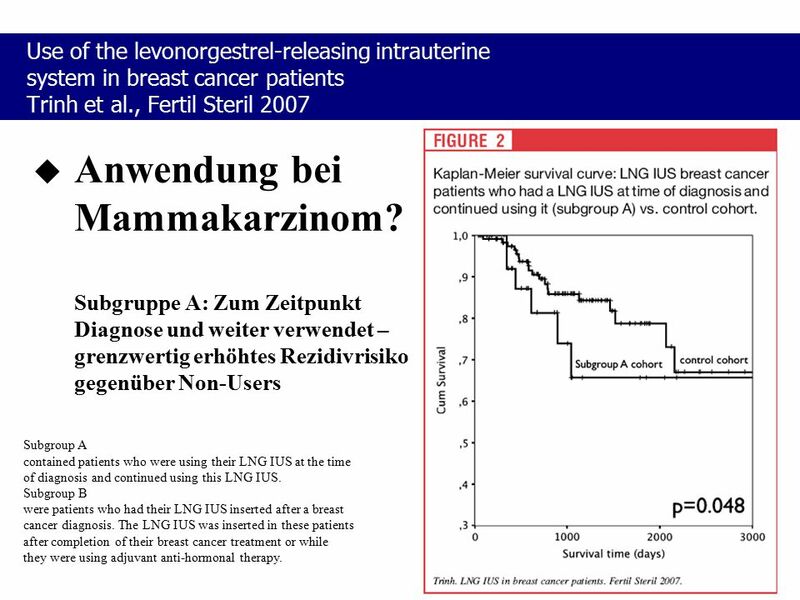 Subgroup B were patients who had their LNG IUS inserted after a breast cancer diagnosis. 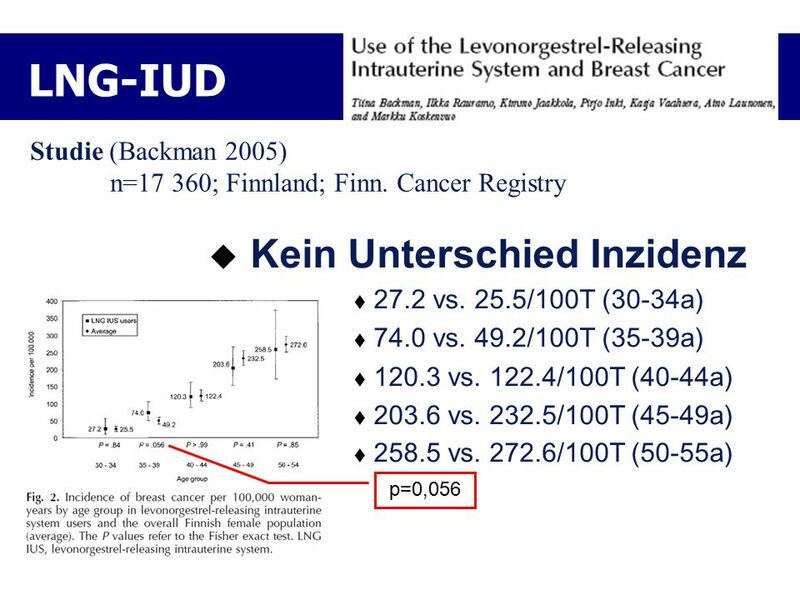 The LNG IUS was inserted in these patients after completion of their breast cancer treatment or while they were using adjuvant anti-hormonal therapy. 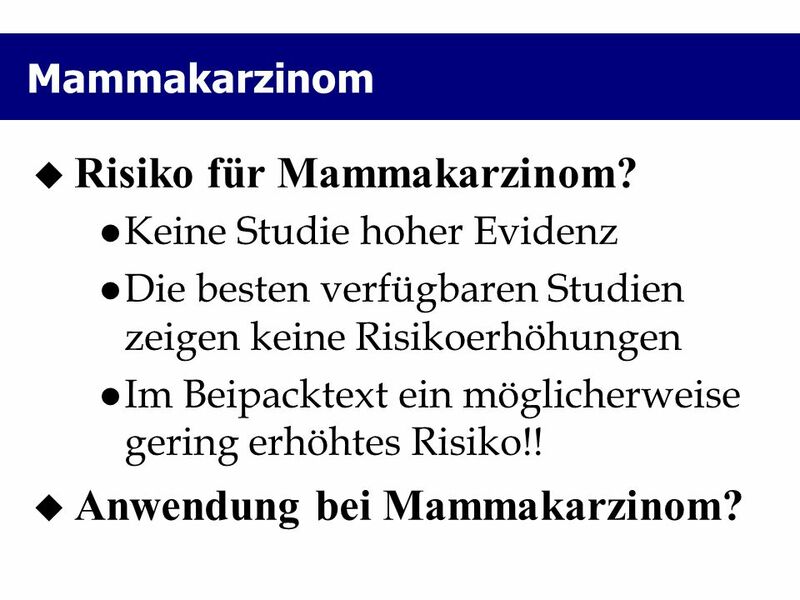 Keine Studie hoher Evidenz Die besten verfügbaren Studien zeigen keine Risikoerhöhungen Im Beipacktext ein möglicherweise gering erhöhtes Risiko!! 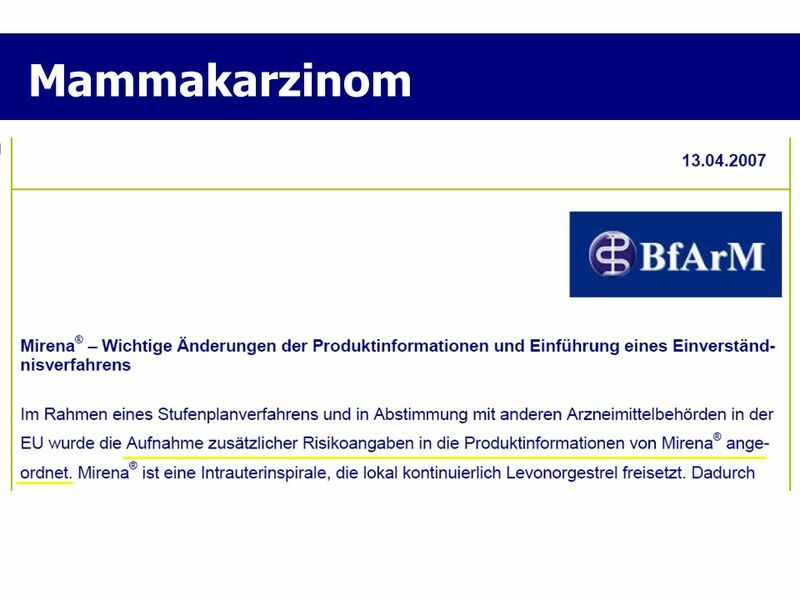 Anwendung bei Mammakarzinom? 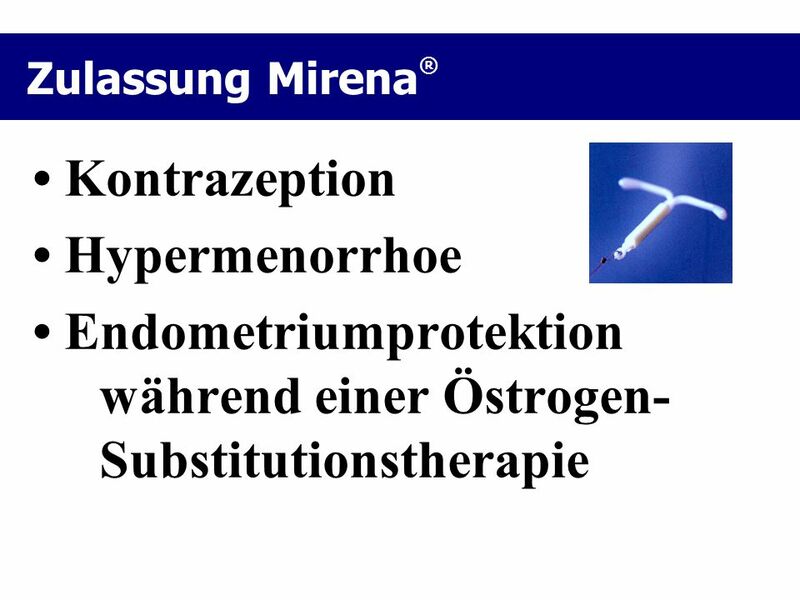 Herunterladen ppt "LNG-IUD (Mirena®) bei HRT, Endometriumhyperplasie und Brustkrebs"
Mammakarzinom Inzidenz und Mortalität in Österreich Altersstandardisierte Raten Jahr Inzidenz Mortalität.